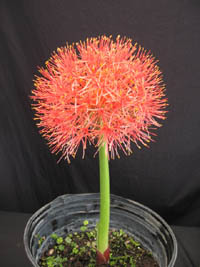 Scadoxus multiflorus is a beautiful flowering bulb from South Africa. 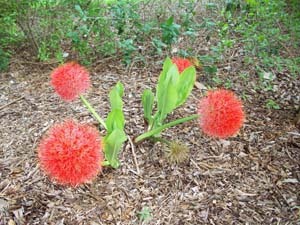 After a dormancy period in the winter, the unusual flower heads emerge in the spring or summer, coming out of the ground with no leaves. 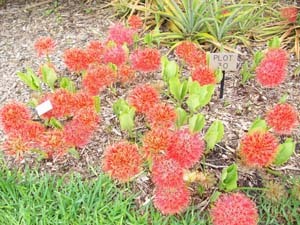 Bulbs need to be mature to flower. Young plants will only produce leaves in the spring/summer. 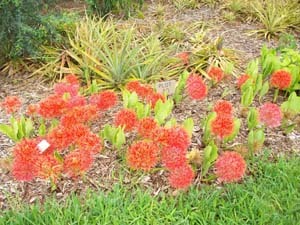 At this time start watering and feeding with regular fertilizer regularly throughout the summer. Around August or September switch the fertilizer for something like a bloom booster, but don't use it too much. Around November the plant will start to go dormant again. During dormancy, reduce the watering a lot (let the soil dry out a little) and don't fertilize. 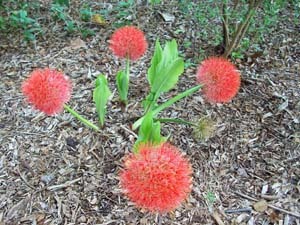 If you live in a cold climate dig the bulbs out and store them in a dark place. Something like a paper bag with vermiculite would be good. 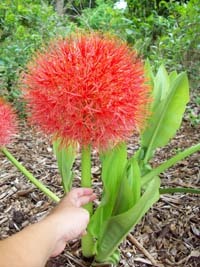 In the spring you should plant the bulbs again. Bury the entire bulb just below the soil, not too deep. 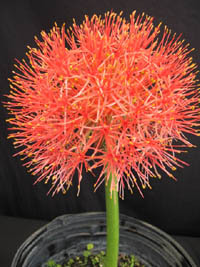 Scadoxus multiflorus grows well in pots and the pots can be stored inside during the winter without you having to dig up the bulbs. Avoid freezing temperatures.